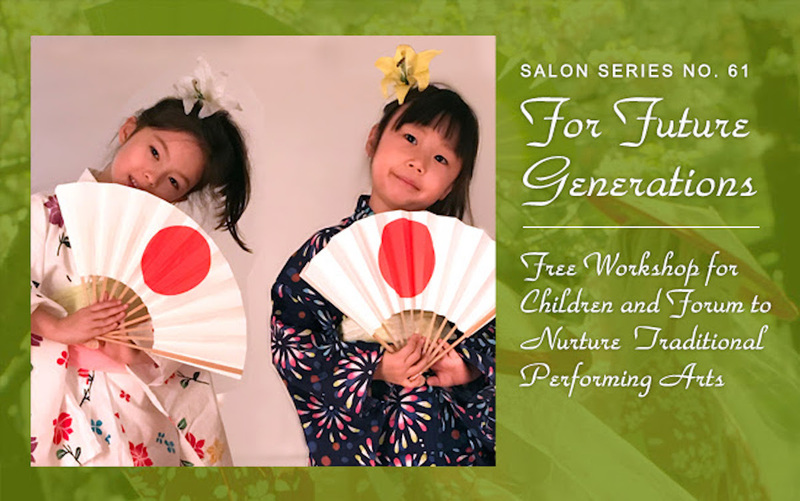 Sunday, March 11 from 3:00 p.m. until 4:00 p.m.
To mark the 20th season of Sachiyo Ito and Company’s Salon Series, the Japanese dance group is looking to future generations of traditional performing arts by offering a free workshop for children. Children between the ages of five and ten are welcome to learn how to express the beauty of flowers with a fan, which will be provided by the company. The program will include dances performed by Dancejapan, the ensemble of Sachiyo Ito and Company, followed by the workshop. Sachiyo Ito is a legendary dancer, dance instructor, and choreographer who has entertained countless audiences with her special blend of classical and traditional Japanese and Okinawan dance for more than 40 years. The Salon Series is a series of informative and educational lectures, lecture-demonstrations, and performances on the performing arts of Japan held three times a year on Sunday afternoons at Tenri Cultural Institute. For more information, please visit Ito’s website, Dancejapan.com. Sunday, April 15 at 1:00 p.m.
Saturday, April 28 at 12:30 p.m. and Sunday, April 29 at 1:00 p.m.
Sunday, June 10 at 3:00 p.m.
Sunday, October 21 at 3:00 p.m.